No need to hurry spring in the Piedmont area of North Carolina. These winter-blooming plants put on spectacular blooms in January, February and into early March. Camellia (Camellia japonica) is a standout evergreen with a showy display of rose-like blossoms in the middle of winter. Daphne (Daphne odora) is a 3-feet tall and wide evergreen shrub covered with fragrant flowers in late winter. It is important to provide good drainage and avoid over watering daphne. 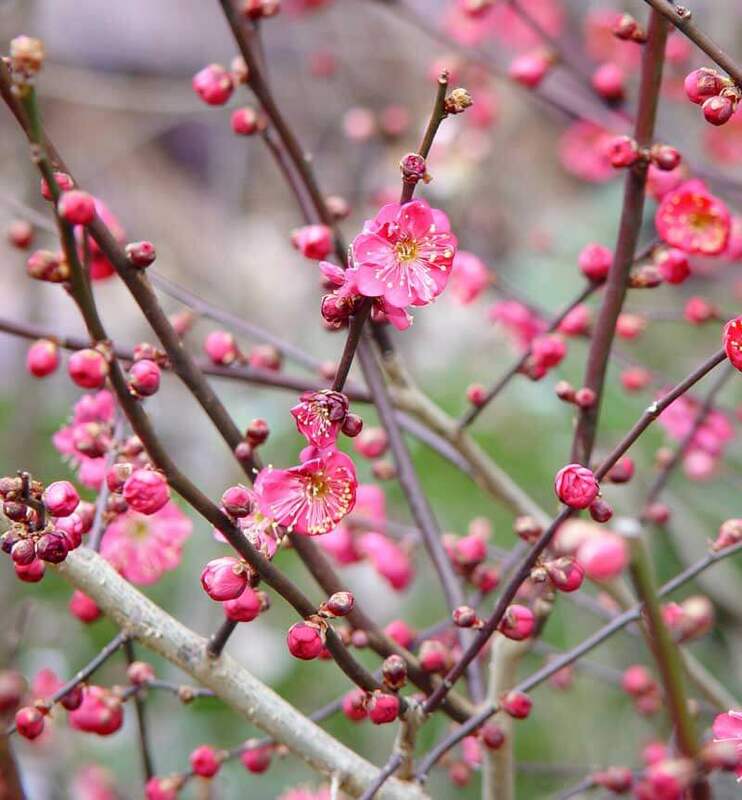 Flowering apricot (Prunus mume) blooms in January lifting the hearts of gardeners with cherry-blossom style flowers in pink, magenta, or white that cover the length of its branches. Hellebores, also called ‘Christmas Rose’, have evergreen foliage and blooms of beautiful cup-shaped flowers from winter to early spring. They are lovely in the shade garden. Mahonia has many species with the evergreen leatherleaf Mahonia bealei showcasing a 3 to 6-inch long raceme of bright yellow flowers in winter. Paperbush (Edgeworthia chrysantha) is a deciduous shrub with silvery buds that open in February with clusters of creamy yellow flowers that release a wave of fragrance you can smell from yards away. Winter Jasmine (Jasminum nudiflorum) is a trailing, vine-like shrub with arching branches. Its willowy green stems are covered with showy, bright yellow flowers in winter. Witchhazel (Hamamelis) has several species. The one that blooms in winter is covered with clusters of spidery-shaped yellow, orange, or red flowers. Plant these against a background of dark evergreens so flowers show off. Beverly Hurley is the editor of Triangle Gardener magazine in North Carolina.